Daniel Kaluuya discovers his potential in-laws are not who they seem. 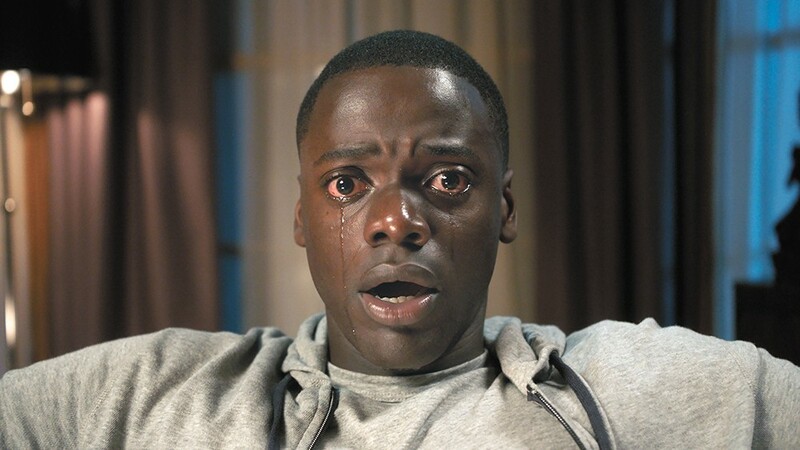 Get Out is a feature-length version of the not-quite-joking sentiment among African Americans that the suburbs, with their overwhelming whiteness and cultural homogeneity, are eerie twilight zones for black people. Far from being a one-joke movie, however, Jordan Peele's directorial debut is a clever, consistently funny racial satire and horror film mocking white liberal cluelessness and finding humor in (without dismissing) black people's fears. Thematically, it's very of-the-moment, though Peele (half of Comedy Central's Key and Peele) has smartly avoided any acutely topical references. His screenplay has a twenty-something black man named Chris (Daniel Kaluuya) traveling with his white girlfriend, Rose (Allison Williams), to meet her affluent family in their prim, well-manicured community. Rose has not told her parents that her boyfriend is black, but she swears they're so progressive that the only race-related problem will be how much her dad talks about his love for Obama. Sure enough, Rose's folks, neurosurgeon Dean (Bradley Whitford) and psychiatrist Missy (Catherine Keener), are educated, gracious and clumsily welcoming: Dean greets Chris with "my man" and proudly tells him that his own father's claim to fame was losing to Jesse Owens in a 1936 Olympics pre-trial race. (This is a gag, but like many gags in the film, it's also foreshadowing.) Dean feels embarrassed to be a wealthy white man who employs black servants (a maid and a groundskeeper), but they worked for his parents before they died and now they're part of the family — a part of the family that, Chris notices, is unusually deferential and mild-mannered, like Stepford wives. There's more weirdness when the extended family and neighbors arrive for the annual summertime gathering. (Rose also has a brother, played by Caleb Landry Jones, who serves no function in the story.) Chris is the only black man among them, save for one (Keith Stanfield) who's married to an older white woman, is as docile as the servants and dresses as though he were his wife's contemporary. Everyone is effusively polite to Chris, earning laughs with their self-satisfied manifestations of "acceptance" — for example, making sure to mention that Tiger Woods is their favorite golfer — that are sure to ring true for a large part of the audience. Chris occasionally checks in via phone with his friend Rod (Lil Rel Howery, soon to be a breakout star), a TSA agent back in the city whose speech and manner are more authentically (stereotypically?) black. In narrative terms, Rod fills the role of Jive-Talking Black Friend — the voice of reason, in other words. That he is, in this case, the Jive-Talking Black Friend to someone whose own interior monologue should be warning him is part of the film's humor about varying levels of "blackness." No one comes out and says it, but there's the implication that Chris dating a white girl has made him lose some of his natural instincts. Get Out is a comedy first and foremost, but there are thriller elements sprinkled throughout (including a trippy hypnosis scene with Chris and Rose's psychiatrist mom), and in the end the plot turns to overt horror. Peele's facility with comedy is well documented, but his deft touch with the scary parts is a nice surprise, and genre fans will appreciate his willingness to deliver satisfying violence when it's called for. Get Out is not showing in any theaters in the area.